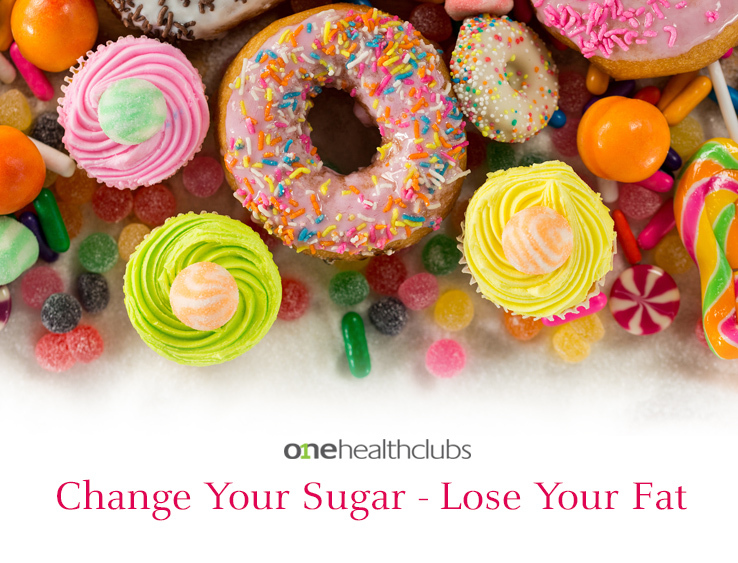 Change Your Sugar – Lose Your Fat! The standard American/Canadian diet is full of sugar and a lot of the time it is hidden sugars in foods that are marketed as “healthy”. It has become so prevalent that if you removed all the items containing sources of sugar from your grocery store shelves just 20% of items would remain. Most of the sugar that we are consuming is not natural, but added highly refined sugar. This is scary for a consumer and we have to ask ourselves, “How did it get to this point”? When you remove fat from a food you compromise on taste, the only ingredient that will make the food palatable again is sugar. So, the question is why are we being faced with an obesity epidemic if we have cut out most fats? Excessive unhealthy food and sugars, especially sweetened soft drink consumption, provides a major and unnecessary source of calories with no nutritional value what so ever. The body needs a certain amount of sugar (glucose and stored glycogen) to function properly and provide your body with energy. Glucose is transformed into glycogen and is stored first in the muscles, then liver. When you consume more than the body requires the excess is stored in the form of fat so that the body can use it for energy later. However, there is no later! As of 2004, the average person in North America consumed 150lbs of sugar in a year. That’s over 22 teaspoons per day! Keep in mind that 1 teaspoon = 4 grams of sugar. The definition of sugar needs to expand from the white crystals you stir into coffee in the morning or the ingredient that you bake with. Sugar is in all breads, cereals, rice, potato, corn, waffles, and pasta sauce etc. • Fructose: fruit, some veggies and honey– in the past this sugar was very rare, but now we find it everywhere. This form of sugar may be causing the most damage due to the amount we are consuming and how it is metabolized in the body. Fructose is highly addictive. One hundred years ago, we were exposed to around 15grams of fructose per day (mostly from fruit). Now, we are consuming 80-150grams per day! That is literally 10x the amount from a century ago. High stress triggers, the need for carbohydrates, specifically refined carbohydrates and sugars, this is where sugar can be looked at as a drug. The more stressed we are the more sugar we crave. The longer the stress is present in our everyday lives, the more our sugar tolerance rises. Our bodies do need sugars to function. Choosing healthy sources are great; however you have to take into consideration how much you are consuming as well. Still feeling like you need more direction? Click here for a free 15-minute nutrition consultation with one of our Nutritionists.